New luxury entrants like Jeep are an interesting bunch and we are often left questioning what they plan to do to compete in an extraordinarily cut throat market like India. That’s not meant in a “what are they even doing?” way but more like “why have they stepped in to a market that is going to be rather difficult to crack?” Nonetheless, having launched a couple of high-end luxury SUVs namely the Grand Cherokee and the Wrangler, Jeep has completed their 4×4 armoury (for now) with the crucial missing piece, a relatively affordable soft-roader. Meet the all-new 2017 Compass – a locally assembled Jeep that’s about to hit the showrooms soon. At first glance it is easy to see what inspired the designers of the Compass – its bigger brother, the Grand Cherokee; this is especially obvious when you look at it from the front. But apart from that, the Compass has its own identity.The Jeep Compass looks tough but also premium, sophisticatedly brawny almost. At the front, the highlights include the wide swath of black that stretches from one headlight to the other – including the modern take on Jeep’s iconic 7-slat (chrome lines) grille. The headlamps have a white element in them which help them pop out – an almost animalistic ‘eyes’ look, according to Jeep’s lead designer Mark Allen. They also contain LED guide lights, these are not DRLs – the actual DRLs actually sit on the bumper, just above the fog lamps. 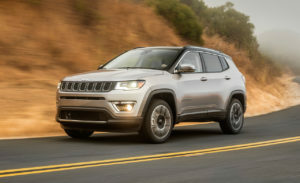 The clamshell hood is sculpted, with a slight power bulge in the middle, but the lines on it are not harsh – Jeep wanted the Compass to look more inviting. The Jeep logo sits on the bonnet, just above the grille. A small horizontal slat-like grille on the painted part of the bumper helps break the huge swath between the main grille and air dam, it also directs air towards the radiator. The air dam is as wide as the main grille and taller – it adds to the muscular look at the front. A chrome lip at the bottom of the air dam adds a bit of bling.The bulk of the Compass is actually hidden well thanks to the use of a thick black cladding that goes all around the car. The Jeep-signature trapezoidal wheel arches contain the 17-inch silver alloy wheels shod with Firestone 225/60 section all-weather tyres; it feels like larger wheels could have made the Compass look even better. Surface detailing like the lines over the wheel arches, the prominent line that passes through the door handles onto the taillamps etc. make the compact SUV exciting to look at. Prominent ‘Compass’ badges are placed on both the front doors. The crowning jewel of the design here is the chrome line that separates the contrast-painted roof from the rest of the body – this line goes all the way from one outside rearview mirror (ORVM), over the windows, swoops down under the rear windshield, up over the windows on the other side to finally end at the other ORVM. The roof line seems to flow down towards the rear, while the windowline rises up, adding a kink at the very end of the windowline and the C-pillar looks like – according to Jeep – a shark fin! The roof rails and the spoiler do not stand out too much.At the rear, the design of the Compass becomes a bit sedate. Highlights here include the wraparound rear windshield with the chrome line running across its base, a two-part taillamps which consists of a prominent LED guide-light (mimicking the units in the headlamps), a slightly recessed number plate holder and a two part bumper with integrated fog lamps. The Jeep logo sits on a carved out recess just below the windshield, a unique touch.Look all around and the Jeep Compass feels solid, the panel gaps are consistent and the paint quality is impressive. The Jeep Compass is offered in five colour options – Exotic Red, Brilliant Black, Minimal Grey, Vocal White and Hydro Blue (the colour of the car you see in the pictures). The Jeep’s cabin is a pleasant surprise. Yes, the design of the dash is quite boring and there are a few not-so-nice bits of hard and shiny plastic – the piano black surrounds around the vents being a prime example – and the touchscreen is small and a bit fiddly to use. Also, it’s quite a step up into the cabin, and the sill is wide, and that could be an issue for short or elderly folk. Otherwise, everything on the inside is executed to such a high level that there’s a genuine honest-to-god luxury car vibe here. The soft-feel textures, supple leather, superbly finished bits of chrome and a build that’s genuinely tank-like, all leave a lasting impression. Jeep has been bold and has specified this top-of-the-line Limited 4×4 variant with premium Alpine leather interior. The soft and supple seats are finished in ‘snow white’ which won’t be easy to keep clean, but they feel so luxurious. And that’s not it: there’s the leather-wrapped steering wheel that gives the cabin a lift, the padded door pads are superbly crafted, the metal-tipped gear knob that gets cooled by the air-con vents is an absolute delight to hold, and the graphics on the screen inside the instrument panel are clear and easy to read. However, the dummy switches on the right of the steering wheel are all too conspicuous and a glaring reminder of missing features. There is a bit of reflection from the dials, and storage space on the centre console is limited, but otherwise, the cabin is thoroughly practical as well. Space on the inside is huge, with plenty of leg- and shoulder-room, and the front seats are extremely comfortable. The bench at the rear has been changed for India. There is now a lot more thigh support due to the longer squab, the seat height is just right, and the backrest is a tad vertical, which, unlike the Tucson’s, doesn’t recline. In fact, rear seat comfort is where the Tucson is clearly better than the Compass and its limited width makes it only suitable for two adults. The diesel version we drove comes powered with Fiat’s new generation 2.0-litre Multijet II engine that debuts in India on the Compass. It makes 173PS of power at 3750rpm and 350Nm of torque between 1750rpm and 2500rpm. The torque is available from 1800rpm onwards below which there is noticeable turbo lag. The narrow, winding roads of Goa didn’t quite allow us to accelerate hard but the motor did feel like the power delivery could have been punchier. The engine is smooth but sounds clattery at idle and is a tad noisy even on the go, especially after 3500rpm. Interestingly, the diesel version of the Compass will not be offered with an automatic transmission and will only come with a six-speed manual transmission. There will be a 7-speed automatic on offer as well, but only with the petrol version powered by the 1.4-litre Multiair engine. That said, a new 9-speed automatic is expected to be offered in the diesel by the end of the calendar year. The manual gearbox feels slick to use though, and gear changes have a precise feel which makes shifting up or down a delight when driving enthusiastically. The steering unit on the Compass is a revelation. Though it is electrically assisted, it feels well-connected to the front wheels. While there is almost no resistance from the steering system at parking speeds, it weighs up nicely as you pick up speed.A brief drive on the beach also gave us a preview of how effective the ‘Selec Terrain’ system is. Controlled via a rotary knob on the lower centre console, it offers shift-on-the-fly traction modes – including ‘Auto’, ‘Snow’, ‘Sand’ and ‘Mud’. Though the Compass has all-weather tyres, which are generally just enough to cope with varying terrains, the AWD system made sure the Compass felt comfortable on soft sand. The system automatically sent power to the rear wheels when it detected slip and stopped it from digging in. On a dedicated 3.5km long off-road track, the Jeep Compass felt like it was built to do such stuff. Water wading, steep inclines, slush tracks, slippery grass, wet rocky terrain and a very bumpy log path were all dispatched with minimal effort. We were tackling all these in the ‘Mud’ mode which locks the 4×4 system and disengages traction control. The short first gear compensates for the absence of a crawler gear and there is enough grunt low down the power band that you don’t need to slip the clutch to go over steep obstacles. The responsive steering wheel has to be given another mention here – it had enough feedback for me to know where my front wheels were pointing at, without tiring my arms. There are six airbags on the Limited variant, though lower variants could get fewer. Fog lamps get cornering function, and ABS, EBD, ESP are obviously there, along with electronic rollover mitigation. The showstopper though is Jeep’s trademark SelecTerrain system. The Compass is primarily front-wheel drive, but four-wheel drive is engaged full-time in auto mode and the system can power the rear wheels whenever it detects a slip. It also offers modes like snow, sand and mud with a mere twist of the rotary knob placed behind the gear lever. There’s hill hold too, and it worked excellently on inclines.